Many organizations question the risks in their existing property program such as adequate capacities and being underinsured. Is there a better way to manage the organization's assets, balance sheet, and growth while reducing high premium costs? Aon&apos;s property risk management experts can be trusted to provide the answers. As the world's No.1 risk broker, you are assured of the best available property risk insurance rates and terms because of our first-tier access to global markets and excellent relationships with underwriters. Often, we are willing to take on challenges that other firms decline. Through every step of the property risk diagnostic process, you benefit from the trusted advice of our property risk management specialists. We determine the efficiency of your existing program's design, terms, limits, structure, and retention. We accurately analyze your property risks with proprietary benchmarking data then uncover opportunities to meet your business goals and reduce your costs. Aon has a proven record of capital efficiency. We lower costs through economies of scale, creative alternative risk transfer, and marketplace repositioning. By analyzing your property risks more accurately, we ensure you pay only for the property risk coverage you require. Because we place more insurance than any competitor and work closely with all underwriters, you receive the best available capacity, terms and pricing. Your service team at Aon is led by a dedicated team leader backed by experts in your industry and the full strength of Aon worldwide. Our most talented people negotiate hard on your behalf, packaging and presenting your submission distinctively. Aon ranked highest on Business Insurance's listing of the world's largest insurance brokers based on commercial retail, wholesale, reinsurance and personal lines brokerage revenues in 2008. A.M. Best deemed Aon the number one insurance broker based on brokerage revenues in 2007 and 2008, and Aon was voted best insurance intermediary, best reinsurance intermediary and best employee benefits consulting firm in 2007 and 2008 by the readers of Business Insurance. As a leader in the reform of property insurance, we ensure full transparency of the brokerage process. To obtain the best property risk insurance solution, you need the broadest market access. 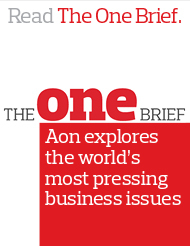 Aon offers the world's largest fully owned network of more than 200 retail and wholesale brokerages. With Aon, you receive seamless property risk management service worldwide and renowned claims management efficiency.